Society tells us one thing about beauty and health, but our souls tell us something else. Let's teach our daughters the truth. When I started my natural beauty business, I wanted the theory behind my business to be understood in as few words as possible. I came to the conclusion that basically, my whole philosophy for being happy and healthy could be summed up in three words ...relax, heal, beautify, and in that particular order. Beauty has just as much power as wealth and fame. Physical beauty is celebrated like nowhere else in the world. Pick up almost any magazine and you'll see just how much importance is placed on it. Perfection is imperative and youth is everything. Health is something that you are faced with everyday if you watch TV. Most of it is negative information. We are bombarded with every drug manufacturer's new masterpiece every hour on the hour. "Do you have insomnia, gas pains, sexual dysfunctions...?" If you weren't sick before, you will be once this negative flood of thoughts seeps into your brain. So what if you stay up late every night, eat processed food, watch death and mayhem on the tube every day, pop an un-natural remedy here or there, and use harsh chemicals in your personal care items? You can always cover up your ill health with toxic make-up! Relaxation is generally related to laziness. It's the "A-type" personality that is usually getting the accolades. Do I hear the term "multi-tasking" here? Going to a spa, or taking the afternoon off once in awhile is thought of as frivolous or something that only the wealthy or more important people do. It's only on a real "vacation" that most people ever truly allow themselves to fully relax. Webster's dictionary describes the word relax this way: 1) to make or become less firm, tense, or rigid. 2) to make less severe or strict. 3) to seek rest or recreation. When I visualize the person that is not relaxed, I picture someone that is firm, tense, rigid, strict, and seeks stress and work. This sounds to me like most of the faces I see out on the roads at rush hour! After years and years of this type of stressful lifestyle, the body gets worn down, along with the mind and spirit. This in turn eventually gives way to lowered immunity, ill health and disease. Relaxation needs to be celebrated. It leads the body to a place of healthful calm, and tranquility. When the body is in a relaxed state, it is in either a state of balance, or it's in the process of healing itself. A relaxed body brings about good heath. Choosing a state of relaxation is a natural need and desire for a reason. It's our bodies' need to regenerate and heal. Surrounding yourself with a natural, relaxed environment, helps to maintain a more balanced existence. I know that when I feel healthy and relaxed, I feel a beauty that is more genuine than physical perfection. It's a beauty that radiates from within. It colors everything that I do in a sensational way. To beautify the outside, you must start from the inside. Sure, makeup can make you look and feel better, but it's only part of the beauty equation. You've heard that 'beauty is as beauty does'. Well it's also how 'beauty feels'. When you feel healthy, you look more beautiful and radiant, period. A fashionable woman wears a beautiful dress. A beautiful woman wears a genuine smile. Living a healthy lifestyle brings you back to the way you were meant to be, a balanced, happy person that is able to relax, heal and beautify! Live your life the way you choose to live it, not the way society tries to teach you to. You don't need anyone's permission but your own. Another kind of 'natural' beauty is confidence. I learned a lot from my years of doing women's makeup professionally, much more than just what colors looked best, and how to accentuate features. I got to know many women, and how they felt about themselves. Almost every one of them would sit down in my chair and say "What can you do about my...". Whether it be a high forehead, a large nose, or wrinkles, almost every woman had something that she wanted me to 'fix'. I finally realized that I was privy to something that most of us are not exposed to, the inadequacies that most women (and maybe men) have about their appearance. It also make me realize that with everyone so busy being concerned with their own looks, they probably weren't looking at me as critically as I thought they were. This taught me to not be so critical about myself. I've always known that nice, happy people become more attractive the more you are around them. And some physically beautiful people can turn ugly before your eyes as they reveal their negative personalities. So it just goes to show that it is truly more important to be a positive, good person, than a superficially beautiful person. Learn what gifts you have to give the world. Find your purpose in life. Be the person with the sunny disposition, and you will never think about your outer beauty in the same way again. Once the attention is taken off perfection, the beautiful soul can shine through. What we think, we are. A lesson that I learned from an acting class taught me a big lesson in life. The lesson was that whatever you are thinking about, will come through you. If you 'feel' something, you are acting the part, and it comes across as the real thing. If you are telling yourself to act a certain way, it looks like you are doing some bad acting. When you walk into a party, are you thinking "Gee, I hope I look alright. I should have worn the other dress. I'm so embarrassed because I've gained weight ...etc... etc..."? Or do you walk in thinking "How fun this is to be here. I'll get to meet new people, try new food. Everybody looks so wonderful and happy, I can't wait to join in to the fun!"? Hopefully you get my point. Next time you have an important meeting, say a job interview, a date, any time you may be a bit nervous to meet with someone, try this mental beauty technique. You cannot 'act' confident. You must be confidant. And the way to do that is to think thoughts that are positive, powerful, and a bit self-prophesizing. It will radiate to others, and you will feel a positive response back. I grew up with a crocheted saying on the wall... "Let a smile be your umbrella". I never really realized that I got so much from that, but I did, and it's message is true. Not only does smiling make you feel better physically, it conveys happiness to others, and makes for a positive interaction. And we could all certainly use more of those in this world. 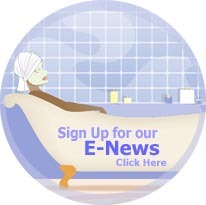 Make sure to visit Sharon's web site, where you'll find all-natural beauty and health products. Copyright 2003-2007 ?/font> SharAmbrosia. All rights reserved.